This lunar mosaic shows the boundary between Mare Serenitatis and Mare Tranquillitatis. The relative blue color of the Tranquillitatis mare is due to higher abundances of the titanium-bearing mineral ilmenite. The results of the study were presented Friday (Oct. 7) at the joint meeting of the European Planetary Science Congress and the American Astronomical Society's Division for Planetary Sciences in Nantes, France. The map of the moon's surface was constructed using data from NASA's Lunar Reconnaissance Orbiter (LRO), which has been circling the moon since June 2009. The probe's wide angle camera snapped pictures of the surface in seven different wavelengths at different resolutions. Since specific minerals strongly reflect or absorb different parts of the electromagnetic spectrum, LRO's instruments were able to give scientists a clearer picture of the chemical composition of the moon's surface. Robinson and his colleagues stitched together a mosaic using roughly 4,000 images that had been collected by the spacecraft over one month. The researchers scanned the lunar surface and compared the brightness in the range of wavelengths from ultraviolet to visible light, picking out areas that are abundant in titanium. The scientists then cross-referenced their findings with lunar samples that were brought back to Earth from NASA's Apollo flights and the Russian Luna missions. These titanium-rich areas on the moon puzzled the researchers. The highest abundance of titanium in similar rocks on Earth hovers around 1 percent or less, the scientists explained. The new map shows that these troves of titanium on the moon range from about 1 percent to a little more than 10 percent. "We still don't really understand why we find much higher abundances of titanium on the moon compared to similar types of rocks on Earth," Robinson said. "What the lunar titanium-richness does tell us is something about the conditions inside the moon shortly after it formed, knowledge that geochemists value for understanding the evolution of the moon." Titanium on the moon is primarily found in the mineral ilmenite, a compound that contains iron, titanium and oxygen. If humans one day mine on the moon, they could break down ilmenite to separate these elements. "Astronauts will want to visit places with both high scientific value and a high potential for resources that can be used to support exploration activities," Robinson said. "Areas with high titanium provide both — a pathway to understanding the interior of the moon and potential mining resources." 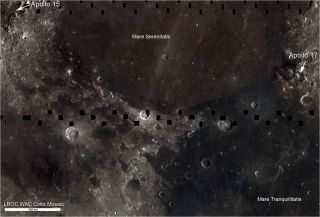 The lunar map also shows how space weather changes the surface of the moon. Charged particles from solar wind and micrometeorite impacts can change the moon's surface materials, pulverizing rock into a fine powder and altering the chemical composition of the lunar surface. "One of the exciting discoveries we've made is that the effects of weathering show up much more quickly in ultraviolet than in visible or infrared wavelengths," study co-author Brett Denevi, of Johns Hopkins University Applied Physics Laboratory in Laurel, Md., said in a statement. "In the [Lunar Reconnaissance Orbiter Camera] ultraviolet mosaics, even craters that we thought were very young appear relatively mature. Only small, very recently formed craters show up as fresh regolith exposed on the surface."